Around 1909/10, H. J. Packer & Co. Ltd of Bristol issued a set of 30 small football stickers in four different versions, numbered and unnumbered, coloured and black and white. Four Newcastle United players were included and No. 19 was W. H. O. 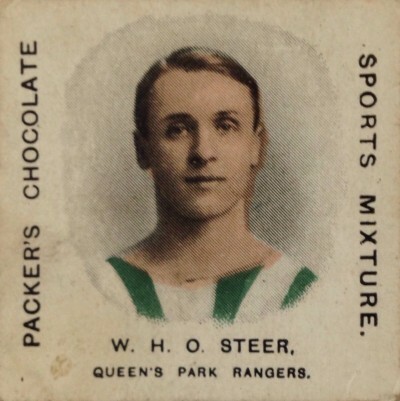 Steer of Queen’s Park Rangers. William Henry Owen Steer was born in Kingston-on-Thames on 10th October 1888. QPR signed him from Kingston Town in 1909 and he made his debut on 1st September at the Park Royal Stadium against Watford. He won six England Amateur caps, (scoring eight goals, including four in the 10-1 win over France in 1910), whilst with the Rangers. William made 76 appearances and scored 37 goals for QPR before being transferred to Chelsea in 1912. Steer later moved to Newry County, continued to play throughout the War and retired in 1918. He passed away in 1969. Interesting to see the player wearing green and white stripes rather than hoops. I hadn’t heard that we wore stripes back then.